Here begins a flurry of posts related to my presentations and workshops at the Texas Foreign Language Association’s conference this weekend. First, our workshop (by our I mean I’m doing this with Amy Lenord, John Cadena, Melissa Vargas) on Thursday night is called Twitter 101 and is about how and why to get involved with a professional learning network on Twitter. In light of a post I saw and some related questions, I put together this handout on understanding some of the lingo that gets thrown around on Twitter. 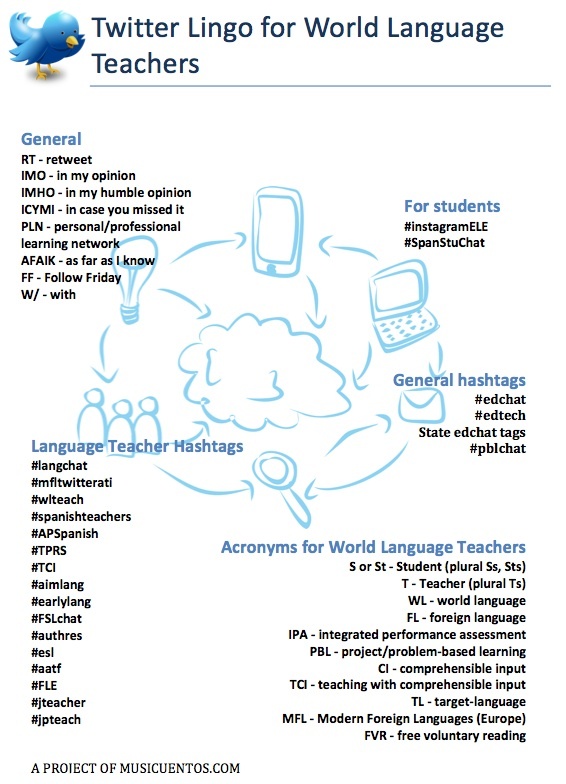 If you haven’t checked out #langchat, be careful. A few simple steps could change your life. Nathan just told me too – can’t believe I missed that one! I’m correcting it now!